Liberals like to paint mass performance as totalitarian and repressive. But the festivals of revolutionary France gave the people a sense of its own power. 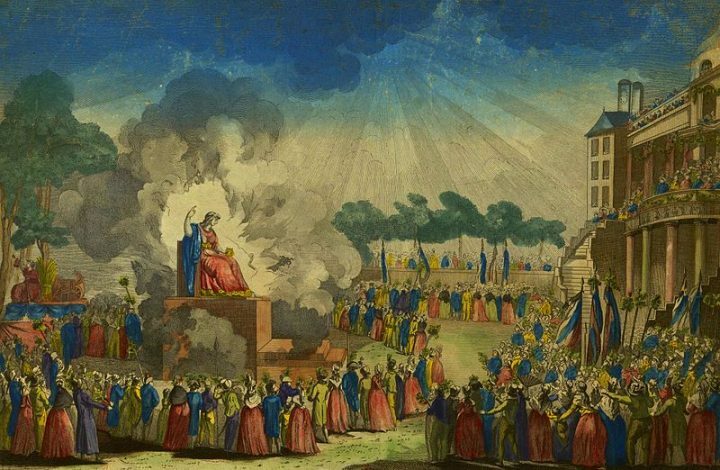 During the upheavals bracketed by the Storming of the Bastille in 1789 and the Thermidorian reaction in 1794, France played host to hundreds of revolutionary festivals. Ranging from small village celebrations to mass urban mobilizations, these events constituted arguably the most significant collective expressions of the revolutionary era. Historically unprecedented in size and scope, the largest of these festivals — the Festival of the Federation in 1790, the Festival of Indivisibility and Unity in 1793, and the Festival of the Supreme Being in 1794 — rallied as many as half a million ordinary men, women, and children in spectacular collective performances. Incorporating processions, mass oath-taking, and human tableaus, they provided a means to bind the decentered agents of revolutionary change into a new body politic. The importance of these mobilizations to the leaders of the period is evident both in the addresses they gave in the National Convention and revolutionary committees, and in the mass of plans and directives for their organization. In the face of a life-or-death struggle against internal subversion and foreign armies, the revolutionary state marshalled staggering amounts of resources and manpower for these celebrations of the volonté générale (general will). This included the service of leading dramatists, composers and artists, most notably the neoclassical painter and revolutionary statesman par excellence Jacques-Louis David, who served as the primary creative director of the largest and most daring festivals of the Jacobin period. Coupling collective expressions of liberty with mass coercion, these events are the clearest demonstration of the contradictions at the heart of the revolutionary project. While they put on display the ideals of liberty, equality, and fraternity, they also served to order and discipline the crowd. They gave symbolic expression to the desires for justice against the iniquities of the ancien régime, while also serving to contain and direct spontaneous expressions of struggle. Moreover, they constituted among the earliest attempts to create a liberated participatory art form, one that foreshadowed the modern use of art as propaganda. The revolutionary leadership’s legitimacy depended on its being able to realize the transformational demands that had arisen from the popular insurrection. In pursuing these aims, the leaders of the revolution coupled an Enlightenment preoccupation for codification with a millenarian desire to begin the world anew. This entailed not only the elimination of the rights and privileges of the nobility and the emancipation of serfs and slaves, but the overhaul of time and space. The French map was redrawn, divided into a chessboard of geographically equal départements, devoid of consideration for cultural identity or physical topography. The old weights and measures were replaced by the newly devised metric system, and this logic of mathematical equality was extended to time itself: days were divided into ten hours of one hundred minutes, weeks into ten-day decades and the months — themselves poetically renamed — into thirty-day blocks. The world itself was reborn; after the overthrow of the monarchy in August 1792, the calendar began again with Year 1 of the new age. Gone were the Catholic saints’ days and the accompanying feasts and rituals that had previously punctuated the year; and the gaps were filled with secular mobilizations in honor of new, revolutionary ideals. Participants in these festivals found themselves in entirely new surroundings. Men and women met together as citoyen and citoyenne, distinctions of wealth were obscured with new trappings — long trousers, the Phrygian cap, the Greco-Roman smock — and the streets and squares they traversed were everywhere renamed. Driven by a desire to transcend the instability and revolutionary period, while proselytizing its ideals, the organizers also looked to the traditions of religious art. As historian Mona Ozouf has argued, the notion of “the sacred” was central to these festivities. They reflected an attempt to transfer the experience of religious catharsis to a new secular and political framework. Nowhere was this more evident than in the festivals in honor of the revolutionary martyrs, over which the painter David held full sway. In the festival honoring the assassinated Jacobin politician Louis-Michel le Peletier, David utilized a pyramid-structured platform to elevate the deputy’s body in a composition that clearly evokes the position of Christ in Michelangelo’s Pietà. 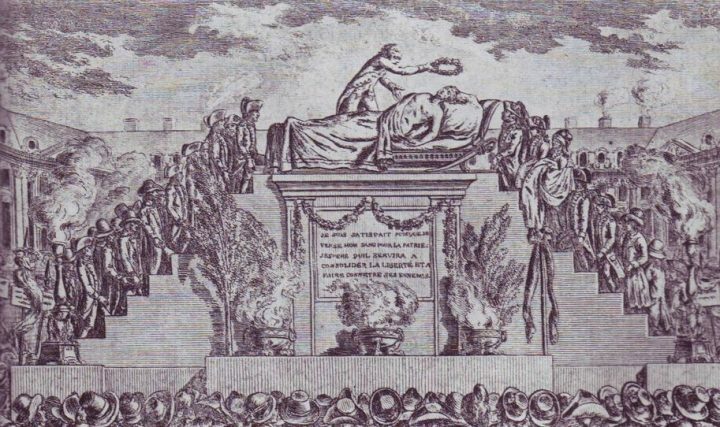 Anonymous etching from Les Révolutions de Paris, “Ceremony to honor the memory of le Peletier de Saint-Fargeau,” 1793. Vizille, Musée de la Révolution française. 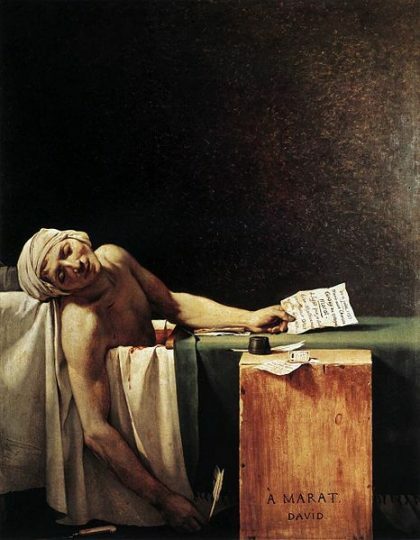 David reused this motif to startling effect in his 1793 painting of Jean-Paul Marat. Here the skin of the murdered radical journalist, in reality afflicted by chronic psoriasis, was rendered alabaster white — a secular saint rising through the darkness to the pantheon of fallen heroes. The painting was ceremonially unveiled like a religious icon at the high point of the commemorative festival to Marat, with participants swearing an oath in unison to fight for the republic, even unto death. The martyr-festivals thus refashioned the tropes of religious iconography to transfigure the revolution’s dead luminaries into universalized abstractions, embodiments of the ideal of public sacrifice. At the heart of the revolutionary festivals stood this tension between the Rousseauian ideal of a liberated citizenry cavorting together in pastoral surroundings, and the didactic drive to educate and organize the masses. The orchestration of these events required staggering levels of coordination; commissions were sent out to the districts of the major cities and the provincial towns with detailed schedules of the planned events and strict orders on everything; from the clothes participants wore to the songs they sang. Temporary altars, statues, and amphitheaters were constructed, while groups of citizens were organized into marching columns, theatrical performances and mass choirs. This should not suggest, however, that the festivals lacked their spontaneous side. Indeed, the original impetus for the revolutionary festivals came with the emergence of ad hoc civic celebrations across the countryside following the Storming of the Bastille. These rural festivals, taking place beyond the watchful eye of the centralizing capital, retained their more satirical and carnivalesque character throughout the revolutionary period. One such rural festival was led by a pig that peasants had dressed in royal robes with Bibles and crucifixes tied to its tail. In other rural festivals effigies of nobles and clergy were paraded backwards on the back of donkeys or burnt or decapitated in the village square. The urban festivals also provided other opportunities for spontaneous initiative, at least for the male attendants. Driven by the spirit of “brotherhood,” city dwellers published pamphlets listing the best brothels in Paris, including addresses, prices, and the services offered. When studied chronologically, the major urban festivals appear, at first, to show a gradual elimination of popular spontaneity, establishing in its place a model of highly regimented national unity. However, such an interpretation is over-simplistic, belying the complexity of the radicalization of the revolutionary project between 1790 and 1794 and the shifting role played by the festivals in this process. 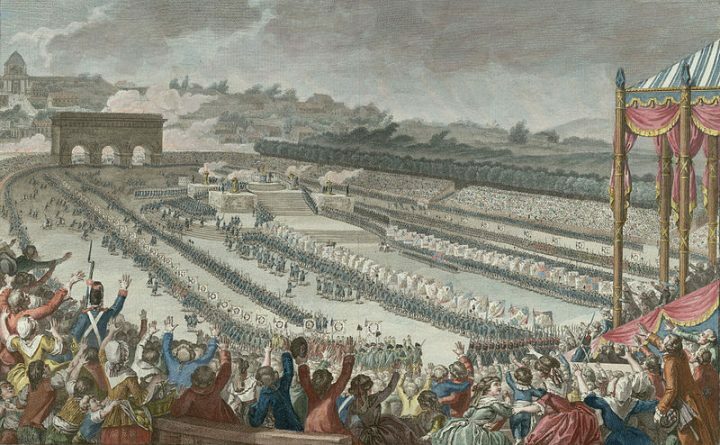 The first major festival, the Festival of the Federation on July 14, 1790, held to commemorate the anniversary of the Storming of the Bastille and the establishment of a constitutional monarchy, rallied upwards of 350,000 participants. Centered on a vast amphitheater on the Champ de Mars, whose rapid construction was possible thanks to the voluntary labor of thousands of Parisians, the festival allowed a collective expression of the joy and hope unleashed by the first wave of the revolutionary period. From the Altar of the Fatherland at the center of the amphitheater the words of an oath to the new France were carried by way of a human microphone, with row after row of participants echoing its words to those behind them. As storm clouds gathered over the city and the rain began to pour attendants broke out into vigorous dancing, the jig spreading quickly through the crowds until an estimated sixty thousand were carried together in its throng. The Festival of the Federation had been a relatively ad hoc affair: its theatrics largely relied on the spectacle of bringing people together in a mass face-to-face gathering, many for the first time in their lives. In seeming contrast to this stood the more regimented Festival of Indivisibility and Unity of 1793. Here, participants were guided through symbolic stations positioned throughout Paris in a day-long participatory procession, in honor of the establishment of the French Republic and the ratification of the radical Constitution of 1793, authored principally by Robespierre and Louis Antoine de Saint-Just. David meticulously planned the day’s events. A ten-page schedule was published and distributed to the army and local authorities to guide the citizen-crowd through the city. Each station of the procession’s route was supremely overloaded in its symbolism, and the day’s events were enlivened with songs, music, and pyrotechnics. The day began at sunrise among the rubble of the Bastille, where a statue in the likeness of the Egyptian goddess Isis had been erected. To the sound of a chorus of white-clad maidens and a volley of gunshot fire, eighty-six commissioners from the regional assemblies drank in turn from water pumped through the breasts of the goddess, before greeting one another with a fraternal kiss. At the second station actresses reenacted the Women’s March on Versailles of October 1789, and laurels were placed on the heads of the real-life participants in that event. The crowd then proceeded to the site of King Louis XVI’s execution, the Place de la Révolution. Here stood a statue to Marianne, lady liberty, next to a mound of symbols to the deposed monarchy. The attendant commissioners set ablaze the symbols of tyranny while thousands of doves trailing ribbons were released into the air. At the fourth site a vast statue of Hercules vanquishing a hydra — the French patrie defeating federalism — was erected on the former site of a statue to King Louis XV. In his hand was a bundle of pikes, the favored weapon of the sans-culottes, the lower-class foot-soldiers of the revolution. The festivities came to a climax at the Champ de Mars, where attendants left offerings at the Altar to the Fatherland, and the new constitution, carved onto tablets, was held aloft among reels of cannon fire. 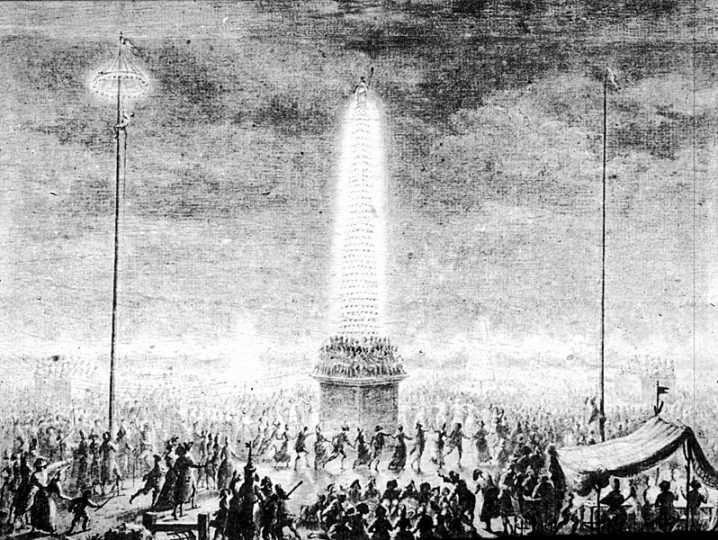 The effect on the attendant crowds was reportedly electrifying, and similar festivals organized on the designs laid out by David were undertaken across France. The largest and most extravagant festival of the revolutionary period took place on June 8, 1794 — the Festival of the Supreme Being. Here the people were not merely led in procession between a series of participatory spectacles. Rather, through an unprecedented effort of mass organization, they became the spectacle themselves: a five-hundred-thousand-strong choir. Rather than commemorate past developments as had its predecessors, this festival instead served to inaugurate a new religion, the revolution-made-faith, the Cult of the Supreme Being. The festival took place between the Tuileries and the former site of the Champ de Mars, renamed the Champ de la Réunion. At the Tuileries, Robespierre delivered a speech lauding the revolution in Old Testament tones, before setting alight to a combustible statue symbolizing atheism and egoism and other vices. A colossal statue of Reason was revealed in its place. 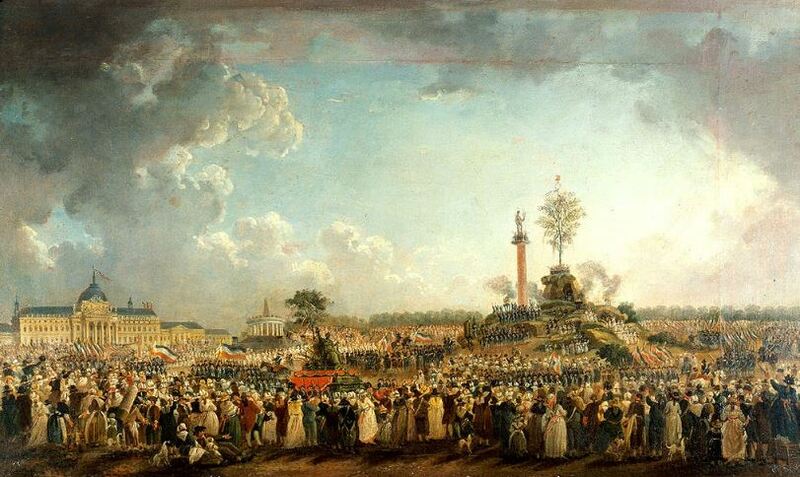 The citizenry then assembled at the Champ de la Réunion, where a fifty-foot pillar topped by a statue of Hercules stood next to a vast artificial mountain crowned by the tree of liberty. At each of these sites the attendant crowds joined in song: at the Tuileries, a new hymn to the Supreme Being, and at the Champ de la Réunion a newly reworded version of La Marseillaise. The festival symbolized the Jacobin-led state’s attempt to chart a middle path between a return to Christianity and the out-and-out atheism of the National Convention’s more fanatical factions. Clericalism was explicitly rejected and the god of Catholic doctrine was replaced with the god of the Enlightenment. Organizing half a million people together in song was no mean feat. To meet this challenge David created a detailed plan for where different sections of the public would stand and sing. The chorus was led by a group of 2,400 citizens, both male and female, composed of fifty singers from each of Paris’s forty-eight districts. These choirs, positioned in front of their respective crowds, would sing a verse at the sound of a trumpet, before the attendant public then sang the verse back again. The end of each song was marked by cannon fire, at which point the entire song was recited again in unison. In preparation for the festival, the printed plan was sent to local administrators and their respective troupe of singers. Copies of the lyrics to the new songs were distributed in public places for a small fee. It would be all too easy to read these developments, in line with the crankiest liberal historiography of the revolution, as reflecting the gradual betrayal of the ideals of 1789: where once crowds gathered in spontaneous celebration there instead arose colossal political rallies where everyone (literate or otherwise) had to read from the same song book. But such an understanding ignores how utterly the situation had changed between 1790 and 1794. King Louis XVI, who had vowed solemnly at the Festival of the Federation to honor the new constitution, went back on his word and in 1791 conspired with foreign powers and émigré noblemen to overturn the revolution. Liberty was under attack from foreign royalism: between 1792 and 1794 republican France faced an escalating war on all fronts as Prussia, Austria, Portugal, Spain, Russia, the Netherlands, and Great Britain all entered the theater of conflict. Civil war broke out, with a royalist uprising in the Vendée region, and a series of assassinations against the revolutionary leadership. While the Festival of the Federation had played host to genuine expressions of public sentiment, it was also orchestrated as a symbolic ending to the revolutionary process. Yet the social peace it sought to present was a façade. Orders issued by the government had commanded that attendants travel to the event on foot, rather than by horse and carriage, in an effort to obscure differences in wealth and power. But these inequalities remained; while for one day the nation stood together as equals, they woke up the next morning to find the social relations of the old order were intact. While modern observers might see the symbolism of the Festival of Indivisibility and Unity as overwrought, it did serve a clear purpose; magnifying the accomplishments of the revolutionary public and then mirroring them back to them. The stations of the procession honored those whose actions had made the revolution possible, the female marchers to the Palace of Versailles and the working-class militants of the sans-culottes. Although it was highly regimented, the procession was organized in a radically egalitarian manner; while the deputies of the National Convention marched together, equal space was given to phalanxes of orphans, blind children, and veterans. Between these diverse groups of honored attendants were organized diverse crowds including local officials, craftsmen, peasants, and black Africans, whose freedom from slavery was enshrined in the new constitution. New realities brought new necessities. The revolution’s accomplishments could not be protected by fine words alone. The revolutionary wars against foreign royalism demanded the state apparatus be transformed into a force capable of supporting prolonged warfare on multiple fronts, popular armies were raised through mass conscription (levée en masse) and the enactment of the radical democracy envisioned by the Constitution of 1793 was put on standby until victory could be assured. The revolution put forward the utopian ideal of a harmonious society in which the good life could be attained by all, but the reality the revolutionaries faced was one of material privations, political instability, and armed conflict. The festivals served the mobilization needed to defend the revolution, because they allowed a dress rehearsal of the type of society it was striving for against insurmountable odds. While it is easy to laud spontaneous celebrations and counterpose them to increased state organization of the populace, the revolutionary public had shown itself capable of far more than picturesque folk dances. The spontaneous risings that had marked the junctures of the revolution were characterized by popular violence against those perceived to stand in the way of the revolution: in the countryside peasants took vengeance against landowners and in September 1792 armed crowds invaded the prisons, executing over a thousand inmates thought to be guilty of counterrevolutionary activity. As historian Sophie Wahnich has argued, these events provided the pretext to the Jacobin Terror, with the revolutionary tribunals serving as a pressure valve on uncoordinated outbreaks of revolutionary violence, satiating a popular appetite for retribution and providing protection against those that, it was assumed, would wreak equally violent vengeance should the revolution fail. Yet the Terror also provided the Jacobin state with the opportunity to combat the more radical demands thrown up by the French revolution. The Hébertists and the Enragés, both of whom called for radical redistribution of wealth and the elimination of religion, were purged and the proto-feminist Society of Revolutionary Republican Women was dissolved, with all women’s political clubs declared illegal. In this context, the Festival of the Supreme Being can be seen as both an attempt to give symbolic representation to the popular demand for radical equality, while also attempting to bind the masses together around the Jacobin project and foreclose more radical demands. This height of popular power was never to be achieved again. On July 27, 1794 Robespierre and the other leading revolutionaries were arrested and sentenced to death, and political power shifted to the hands of the Directory. The tension between popular agency and state mobilization had been dissolved firmly in favor of the latter. As Jacobin Terror gave way to White Terror the Thermidorian Reaction executed the leaders of the Paris Commune and violently dissolved the revolutionary clubs and associations. This collapse of popular engagement with the festivals coincided with the demise of popular participation in the revolution. The promise of universal (male) suffrage enshrined in the Constitution of 1793 was scraped; replaced with a franchise that restricted voting rights to those who owned property and a sizeable income; soaring food prices brought widespread impoverishment while speculators secured handsome profits; and the sans-culottes, the stalwart defenders of the poor, were ignobly disarmed. The revolutionary festivals of 1790-94 had celebrated the people as the architects of the revolution, exulting them to move forward, while also curtailing (for better or for worse) their more autonomous and riotous impulses. These events had proven to be genuinely popular because they had articulated, through collective performance, the hope of a radically different organization of society. The festivals of the Directory, by contrast, offered symbolic closure of the revolutionary period and the ossification of its bywords and symbols. Attendance of these new festivals was by all accounts, pitifully low, declining steadily under the Directory, in spite of the passing of a desperate (unenforceable) law in September 1798 that made attendance obligatory. Deprived of any meaningful involvement in political life the people of France voted in the only manner left to them — with their feet. Dominic Mealy is a Berlin-based organizer of gabber parties and a member of Die Linke.